O God, who made the Mother of your Son to be our Mother and our Queen, graciously grant that, sustained by her intercession, we may attain in the heavenly Kingdom the glory promised to your children. Through our Lord Jesus Christ, your Son, who lives and reigns with you in the unity of the Holy Spirit, one God, for ever and ever. Amen. On August 15th the Church celebrated the Solemnity of Mary’s Assumption, body and soul, into Heaven. One week later is the celebration of Mary’s Queenship on August 22nd. These two celebrations are theologically connected. The Assumption celebrates an event. The Queenship of Mary celebrates Mary’s status and builds upon the Mystery of the Assumption. The Second Vatican Council, in the document on the Church, explains that “the Immaculate Virgin, preserved free from all guilt of original sin, on the completion of her earthly sojourn, was taken up body and soul into heavenly glory, and exalted by the Lord as Queen of the universe, that she might be the more fully conformed to her Son” (Lumen Gentium 59). The liturgical prayers for the celebration of the Queenship of Mary, expressed that the heart of this mystery is Mary’s role as our heavenly intercessor and a crucial person in the life of each Domestic Church. The biblical foundation for unpacking this mystery is found in four sources: (1) The Queen Mother in the Old Testament, (2) the Wedding at Cana, (3) Pentecost, and (4) The Heavenly Liturgy recorded in the Book of Revelation. In the Old Testament accounts of the Davidic kingdom, the Kingdom from David which Jesus fulfills, the Queen of the kingdom was not a wife of the king but the king’s mother (1 Kings 1-2, Jeremiah 13:18-20). She is recorded as playing the part of a Queen who intercedes on behalf of others who have a request for the king (1 Kings 2:17-20). Jesus is from the family of David and is the fulfillment of the Davidic Kingdom; His queen is His mother. In the Wedding at Cana, recorded in John 2, Mary brings the problem of a loss of festive drink at a wedding reception to Jesus; through her Intercession, Jesus changes water into wine. The first miracle of Jesus happens at the request of the Queen Mother. After Jesus ascended into heaven, Mary is the only woman named in Acts 1 as the Church prayed and prepared for the outpouring of the Holy Spirit at Pentecost in Acts 2. Mary, the Queen Mother, intercedes for the Promised Gift of the Spirit. The Book of Revelation depicts the Heavenly Liturgical Worship. In the Heavenly Liturgy, the Angels and Saints are praying for the people and events on earth (Revelation 6:9-10, 8:3-4). Mary is depicted as a Queen of Heaven in Revelation with a “crown” and queenly garment for the Queen of Heaven (Revelation 12:1). Her child is Jesus, but she is also the Queen Mother of “the rest of her children, those who keep the commandments of God and hold the testimony of Jesus” (Revelation 12:17). How often do I ask Mary to pray for my spouse? How often do I ask Mary to pray for my children or grandchildren? How often do I ask Mary to pray for my elderly relatives within my care? How often do I ask Mary to pray for my family in a moment of crisis? How often do I ask Mary to pray for my family when we are triumphant? 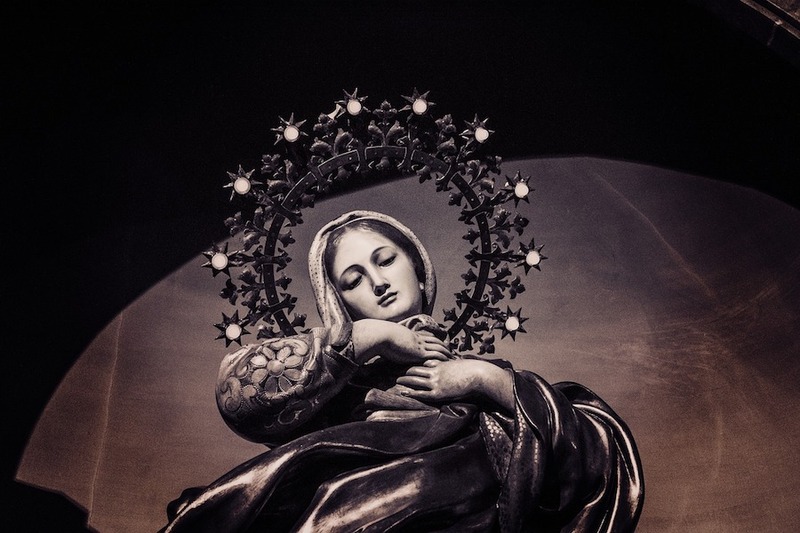 How often do I ask Mary to pray for those who persecute me? The liturgical celebration of the Queenship of Mary on August 22nd is an excellent opportunity to put into practice and explain to those within our Domestic Church the reality of Mary’s queenship and role as heavenly intercessor. This can be done by praying the Glorious Mysteries of the Rosary as a family, attending Mass and honoring the parish church’s image of Mary with flowers, reading and discussing one of the biblical scenes mentioned within this article, meditating on one of these passages, ensuring children understand what it means for Mary to pray for us in heaven, or spending a moment gazing upon the household image of the Blessed Queen Mother. The Queen Mother of the Old Testament was a powerful intercessor. The Queen Mother of the New Testament, the Virgin Mary, is an even more powerful intercessor who lovingly aides us with her prayers to her beloved Son, Jesus Christ and King of Glory. The grace of her Assumption and Coronation is not in competition with the glory of the Savior but a grace given to her by Jesus. Striving for holiness as disciples of Jesus Christ within the home is challenging. We need all the help we can get. Jesus crowned Mary for our benefit.